The Safe Place is where children go to change their inner state from upset to composed. The skills you teach in the Safe Place are essential for self-regulation. A chair, beanbag, or other comfortable seating serves as a base for your Safe Place. With toddlers, the Safe Place needs to be big enough to hold both you and the child so you can co-regulate. Fill the Safe Place with tools and activities that support the active calming process. Upset toddlers rely heavily on the adult’s ability to help them calm. Your lap or chest is a child’s primary Safe Place. Hold the upset child and breathe deeply. Then coach him in breathing deeply. When toddlers are calm, spend ample time teaching and modeling relaxation techniques so children can learn how to calm themselves. Sophie is a S.T.A.R. 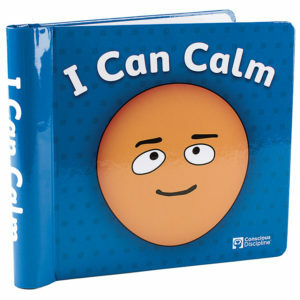 is essential for teaching active calming. Read it regularly and provide props for children to practice deep inhales and exhales. S.T.A.R., Drain, Pretzel and Balloon are the core four breathing techniques we teach in Conscious Discipline. You can download them for free under Free Resources on our website. Once you’ve established a solid repertoire of Safe Place skills together, toddlers may begin to practice the active calming techniques independently with the assistance of props like the I Can Calm book, the S.T.A.R. Breathing Tool, and the Safe Place Mat. You will still need to offer plenty of aid and encouragement as children begin to experiment with active calming on their own. The key phrase for the Safe Place is “You’re safe. Breathe with me. You can handle this.” Helpful phrases for guiding children to the Safe Place include, “Your body is telling me you’re having a tough time right now. Let’s go to the Safe Place together to calm down.” “Your face is going like this (mimic the expression on her face). You seem anxious. I wonder what we have in the Safe Place that would help.” As with any interaction, your intention will have a great impact on the way children receive your message. If you say, “You seem angry. Let’s GO to the Safe Place together,” in a tone that is frustrated, exasperated or seeks to make the child comply, the child is likely to feel threatened and shut down or lash out. If you say the exact same words, “You seem angry. Let’s go to the Safe Place together,” in a voice that sees the child as capable and carries the intent of helping her learn to self-regulate, the child will be more likely to go to the Safe Place with you and learn to manage her feelings in healthy ways.